Weardale and Upper Teesdale is situated towards the west / south–west of County Durham and offers some very good birdwatching and photographic opportunities. The Dales can be visited at any time of year and is probably best known for the Red Grouse and Black Grouse that can be found there. 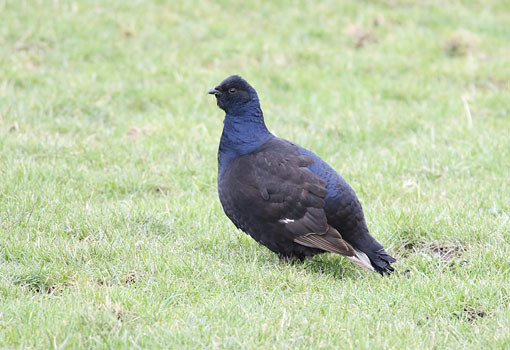 It is reported that the Dales is Englands last stronghold for the Black Grouse and it is recommended to view them from the car, roadside or public footpath at a safe/sensible distance. For me, obtaining quality photographs of Black Grouse has been very frustrating and my patience eventually paid off 1–2 years ago when I managed to grab a few good photos from a path without disturbing the birds. Red Grouse can be seen and photographed from the comfort of the vehicle, often at a distance of less than five yards. Common Buzzards are becoming more frequent and there is now the opportunity to see untagged Red Kites (from the released Northern Kites Project). Other raptors could include Peregrine Falcon, Merlin, Sparrowhawk, Goshawk and Common Kestrel. There is also an outside chance of seeing Raven and Common Crossbill. Summer months offer the chance to see other moorland specialities such as Dunlin, Curlew, Golden Plover, Ringed Plover, Lapwing, Common Redshank, Woodcock and Ring Ouzel. Recent migrants have included Dotterel and Osprey. The Dales also offer ancient woodlands (Oak & Beech), which can be excellent for Common Redstart, Wood Warbler, Spotted Flycatcher and Pied Flycatcher. For me, the Dales covers the area from Bishop Auckland to Wearhead (along the A689), then working the B roads that lead towards Middleton–in–Teesdale and Brough. The A66 will lead you back towards Barnard Castle and some of the B roads that lead off this road are worth checking, as well as some of the woods in & around Barnard Castle. Travelling these roads can be very hazardous in the winter months and it is best to avoid the area in poor weather conditions (especially snow).